Mount Everest was photographed from orbit by Russian Cosmonaut Yuri Malenchenko last week, showing the peak of Earth's highest mountain. This story was updated on Dec. 18 at 10 a.m. ET. Editor's Note: NASA has retracted the claim that the mountain seen in the above photograph is Everest. Instead, the space agency says Malenchenko's photo portrays the Indian mountain Saser Muztagh. 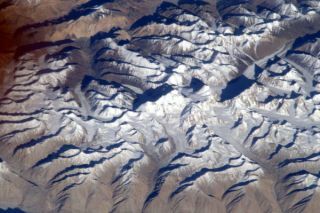 The world's highest mountain doesn't look quite so high from space. Russian cosmonaut Yuri Malenchenko recently snapped a shot of Mount Everest from his perch 230 miles (370 kilometers) above Earth on the International Space Station. The photo shows the peak of Everest nestled among other crags in the Himalayas, with snow lightly dusting the tops. Such a famous mountain, one of the world's most iconic climbing goals, is an often-sought photographic target for astronauts in orbit. But it's harder than you might think to catch a good snapshot of the mountain, or any specific landmark on Earth, astronauts say, because their schedules are so packed tight, and photos of Earth locations must be timed carefully. Malenchenko snapped the photo of Everest on Nov. 9, and NASA astronaut Ron Garan posted it on Twitter Dec. 8, writing, "I never got a good shot of Mt. #Everest #FromSpace." Garan flew to the space station last year as part of the orbiting laboratory's Expedition 27 mission, living and working in orbit from April to September 2011. Malenchenko launched to the station this July, and returned back to Earth Nov. 18. The station is currently home to three spaceflyers: Kevin Ford of NASA and Oleg Novitskiy and Evgeny Tarelkin of the Russian Federal Space Agency. The trio will be joined by three new crewmembers set to launch on a Russian spacecraft Dec. 19, just in time for an orbital Christmas.